Kate Kim and her husband had just arrived home to Anaheim Hills from a long journey to Brazil. Their bags had not been unpacked. The very next day, when wild flames swept across neighboring hills, burning down homes and threatening lives, a disaster was declared. When evacuations became mandatory for surrounding cities of the “Canyon Fire 2”, Kim, her husband and their dog dashed out with some documents, photographs and a few belongings. “We just picked up the bags. They were still packed-and left,” Kim explained. Evacuees rushed from their homes, work and schools to safer locations, however many found themselves backed up in sluggish traffic as the smoke loomed over and the ash precipitated down. Some locals made their way over to one of the American Red Cross Shelters. Evacuees arrived on two legs and those who arrived on four were escorted to the on-campus animal shelter. 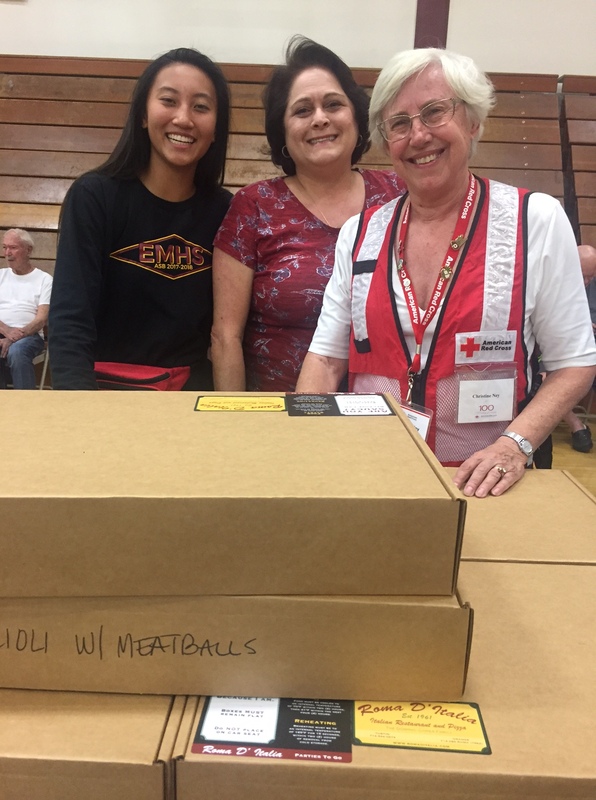 Upon Kim’s arrival to the Red Cross Shelter at El Modena High School, she noted that they were greeted with a warm reception, offered food, a comfort kit, and sleep accommodations. Throughout the Red Cross shelter with all of its activity, many different stories came out. Among them, different levels of emotion ranging from anxiety over the circumstances surrounding their home to relief they and their families were safe from the fire. Kim expressed gratitude that her dog was being cared for in the temporary animal shelter and was touched that onsite health services were walking by and offering services to those in need. Having the ability to charge her cell phone in the AT&T charging station impressed the South Korean native. “We thought, ‘Wow! What a great country America is! They have all of this,’” She gestured around. There were many volunteers who collaborated in offering relief to the shelter residents. Christine Ney, a Red Cross Disaster Action Team Captain, worked diligently with a smile on her face, making the experience all the more comfortable to the evacuees. Photo (L-R) Hannah Tjoa, Teresa Corea-Golka, and Christine Ney have good taste when it comes to serving up comfort away from home. While waiting for the evacuation to be lifted, Mrs. Kim was not focused on a fire possibly threatening her home. She believed that worrying would not help the situation. When Kim checked into the shelter, she checked the heaviest baggage at the door – her worries.